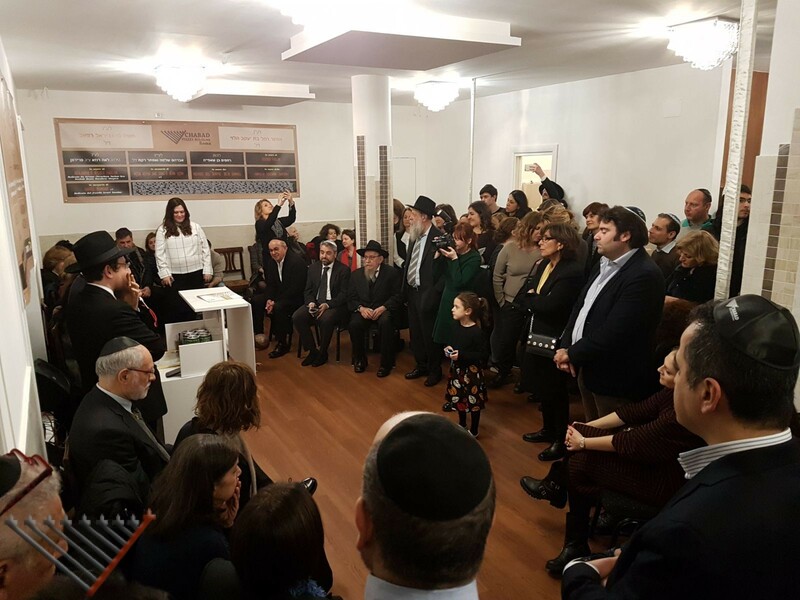 A beautiful buffet welcomed the guest at the inauguration of the new Chabad center in Piazza Bologna after nine years of constant work, Chabad finally has a place to call home for all their activities. The center has a big hall for events, classes and meals, an office where one could find any Jewish necessity and a kitchen. Rabbi Lazar called up the honored guests at the podium, starting with the director of Chabad Rome, Rabbi Itzchak Hazan, followed by Rabbi Moshe Lazar, Shliach in Milan and father of Rabbi Menachem Lazar. Representatives of the Jewish community, Mrs. Ruth Dureghello, president of the Jewish Community of Rome and Mrs. Noemi Disegni, president of the Union of the Jewish Communities in Italy, spoke about the importance of having a Chabad presence. Rabbi Lazar invited also the President of the II Municipio of Rome, Mrs. Francesca Del Bello, to bring the greetings from the city of Rome, present was also the minister Marianna Madia and Valentina Grippo. Manuela Disegni, Emanuel Naccache and Cesare Moscati shared their personal experience with Chabad and then Rabbi Lazar presented the awards to the donors present. The over 150 participants then enjoyed the lavish buffet, dessert table and the outdoor setting. This entry was posted in News on February 26, 2018 by Menachem Lazar.